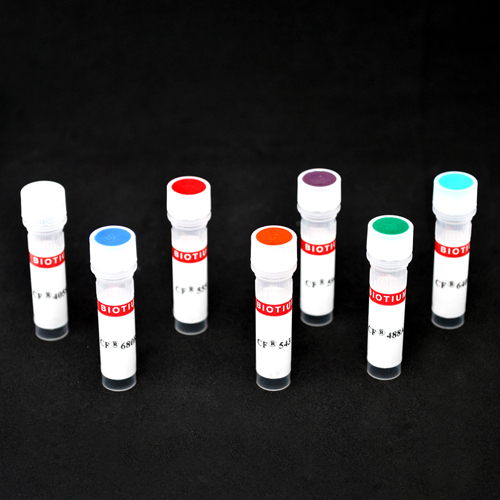 CF® dye-dUTP can be used for TUNEL assay, or to synthesize labeled DNA probes for in situ hybridization and nucleic acid blotting applications. It’s available with the following CF® dyes: CF®405S, CF®405M, CF®488A, CF®543, CF®568, CF®594, CF®640R, and CF®680R. Also see Biotium’s CF® dye TUNEL assay kits. 5-Aminoallyl-dUTP (AA-dUTP) can be enzymatically incorporated into DNA. The resulting amine-containing DNA can be subsequently labeled with a fluorescent dye, biotin or other haptens via conventional peptide coupling method (1,2). Cyanine 555-dUTP and Cyanine 647-dUTP can be used to synthesize labeled DNA probes for in-situ hybridization, microarray or blotting techniques. Cyanine 555 is structurally identical to Cy®3 while Cyanine 647 is structurally identical to Cy®5 from GE Healthcare. CF® dye dCTP can be used to synthesize labeled DNA probes for in-situ hybridization, microarray or blotting applications. Digoxigenin-dUTP can be enzymatically incorporated into DNA via nick translation, random priming, or 3'-end terminal labeling to synthesize labeled DNA probes for in-situ hybridization, microarray or blotting techniques. The digoxigenin labeled probe could be detected by using fluorescent labeled or enzyme labeled anti-digoxigenin antibody. Fluorescein-12-dUTP can be used to synthesize labeled DNA probes for in-situ hybridization, microarray or blotting techniques.